Robots are undeniably cool. But the humanoid kind—Johnny Five, say, or the T–800—can be complex, sometimes sarcastic, and potentially deadly. But you know what’s never accidentally assisted bank robbers or blown up anything? A friendly robot ball named Sphero. Sphero 2.0 is indeed the second iteration of the hardware, so props to its developer Orbotix for giving it a name that makes sense. (Cough, cough, Xbox One.) Under the sphere-shaped hood, the motor is more powerful, the color-changing LED is brighter, and the center of gravity is lowered. So while it’s faster—with top speeds of just under 5 miles per hour—it’s easier to maneuver, as well. The main driving app, also called Sphero, lets you steer the ball with a digital D-pad or tilt controls, and optionally take photos and video as you drive. It’s sort of like driving a remote-control car, but because it’s a white sphere with no visible front or back, you often have to realign the ball in the app by pointing its blue tail light toward you. This ensures that the driving controls on your screen match the ball’s real-world orientation. You can even drive Sphero in water—it floats. The nubby rubber cover helps it maneuver better. It’s easy to get the hang of, and rookie drivers get some extra help, too. The updated Sphero driving app starts you off at slower speeds, and you actually level up your ball the more you drive it. That gradually increases your Sphero’s top speed over time, as you get better at controlling it, so it’s not just whizzing around your living room and getting stuck under your couch while you’re trying to master the controls. Each time you level up your Sphero, you get to select from a menu of upgrades. For example, you can unlock Rainbow Drive mode (which rotates through all the ball’s colors at full brightness as you drive), or add boost sequences for an extra burst of speed. While driving, you can also earn points that can be spent on temporary previews of the upgrades—letting you know what’s coming when you actually level up. Shero currently has 20 levels to beat (Orbotix says they can all be reached with about 8 hours of total driving). Minigames in the driving app introduce a bunch of activities that can be found in other iOS and Android apps compatible with Sphero. With 25 ancillary apps in the Sphero universe, you’ll discover there’s much more you can do with the ball than just drive it around. The other apps—from both Orbotix and third-party developers using the Sphero SDK—add a ton of extra value and replayability for older kids and adults alike. The excellent Sphero Golf app, for example, lets you set up a mini–golf course around your house and yard, then swing your smartphone like a golf club to send the Sphero rolling toward the pin. Sharkey the Beaver uses augmented reality to turn your Sphero into a cartoon pal who’s always ready for a photo op. 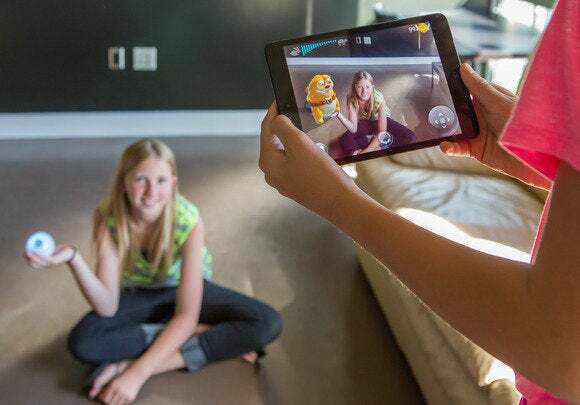 Two apps use augmented reality. The better of the two, The Rolling Dead, has you roll your Sphero into pretend zombies that sprout up from your floor and lurch across your phone’s screen. And the less-cool-but-still-cute Sharkey the Beaver transforms your Sphero into a cartoon critter that roams around gobbling coins and cake. Other games have you hold the Sphero and use it as a 3D controller, as in the clever and addictive Sphero Exile, in which you twist and turn the Sphero to control your fighter pilot in a top-down shooter. The less-compelling Disc Groove for Sphero has you spinning the titular disc to avoid collision with musical meteors. Sphero Exile makes the ball into a 3D game controller. Kids can even learn about programming: Sphero Macrolab lets you assemble sequences of predefined macros for Sphero to execute, and orbBasic lets you program behaviors for Sphero using the BASIC language they used to teach kids in the 1970s and ’80s. Many of these add-on Sphero apps are fun at first but gradually lose their novelty. Still, most of them are free, and even if you only latch on to one or two—Sphero Golf being the most worthwhile—you’ll get a lot more playtime out of your Sphero. That said, driving it around is still the main draw—especially because Orbotix now includes a couple of plastic jumping ramps in each box, as well as a nubby, rubber all-terrain cover (a $15 add-on, or free if you purchase Sphero from Brookstone) that gives the ball better traction on slick surfaces or in water. My almost–2-year-old loved it, chasing Sphero all around the house, screaming with glee—he tends to get upset when I let him catch it, and near-apoplectic when the ball needs recharging after about an hour of drive time. While you can buy several iPhone-controlled toys (from cars to bugs and beyond), only the AR.Drone quadricopter is as sophisticated and consistently fun to pilot as the Sphero. And Sphero 2.0 ups the ante on the first version with better driving and a much larger slate of compatible apps. If you’re looking for a nerdy activity to share with your kids—or just indulge the nerdy kid inside you—Sphero lets you have a ball. This story, "Review: Sphero 2.0 is a brighter, faster, smartphone-controlled ball of fun" was originally published by TechHive.